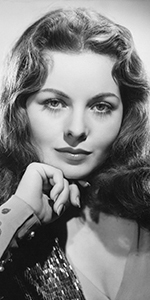 Jeanne Crain was another of the hot-cha actresses under contract to 20th Century-Fox after World War II. She excelled in musicals, comedies, and dramas. Reaching stardom quite young, she gradually stopped making films in the 1970s. Born to Irish parents, Crain's father was a school teacher, who moved the family to Inglewood, California, when young Jeanne was five. At age seven, her parents divorced; she moved with her mother to a duplex in South Central Los Angeles. Taking up figure skating, Jeanne became Miss Pan Pacific during a beauty pageant held at the Pan Pacific Auditorium in 1941. While still in high school, she did a screen test with Orson Welles which led to her nabbing a bit part in the Carmen Miranda musical The Gang's All Here (which played the Chinese in December, 1943). During the shoot, the 18-year-old was signed up to a contract at Fox; one of her first PR appearances was at Monty Woolley's imprint ceremony on Friday, May 28, 1943, helping the great man imprint his beard. Strong impressions were made in a supporting role in Home in Indiana (which played the Chinese in June, 1944), and by headlining the film In the Meantime — Darling (played in September, 1944), got her the starring title role in an "A" picture: The Shocking Miss Pilgrim; but the role went to Betty Grable instead and bombed (and played the Chinese in February, 1947). Director George Cukor helped Crain deliver an impressive performance in Winged Victory (which played the Chinese in December, 1944). Crain carromed from musical to comedy to drama with ease; she starred in the musical State Fair (played the Chinese in October, 1945), and played the second female lead in the whopping hit Leave Her to Heaven (played in December, 1945). Crain married actor Paul Brinkman at the end of 1945. They would welcome thier first child, Paul Brinkman, Jr. in April, 1947. By then, Crain had starred in the Technicolor comedy Margie (which played the Chinese in November, 1946), where she got to show off her ice-skating skills. After the birth of Paul Jr., Crain starred in You Were Meant for Me (played the Chinese in January, 1948), and Apartment for Peggy (played in October, 1948). 1949 has to be considered Crain's busiest year; she got top billing over Linda Darnell and Ann Sothern in A Letter to Three Wives (which played the Chinese in February, 1949), got top billing in an adaptation of an Oscar Wilde play The Fan (released in April, 1949), and finally, having the title role in Pinky (which would play the Chinese the week following her Forecourt ceremony, in October, 1949). Crain brought along her 2-and-a-half-year-old son Paul Brinkman, Jr. to help her make her impressions. She played the oldest daughter Ann, in the comedy Cheaper By the Dozen (which played the Chinese in April, 1950), then co-starred with Cary Grant in the comedy / drama People Will Talk (released in September, 1951). Rounding out her Fox contract, she appeared in The Model and the Marriage Broker (played the Chinese in December, 1951), was in the Cheaper By the Dozen sequel Belles on Their Toes (played in May, 1952), and Dangerous Crossing (released in April, 1953). After leaving Fox, Crain did a few pictures at Universal-International, including Man Without a Star with Kirk Douglas (released in March, 1955). Then to United Artists for Gentlemen Marry Brunettes (released in October, 1955). She also starred in The Fastest Gun Alive with Glenn Ford (released in July, 1956), and The Joker is Wild with Frank Sinatra (released in October, 1957). She also appeared in Lucille Bremer's role of Rose in a television version of Meet Me in St. Louis over CBS in 1959. Going into semi-retirement in the 1960s, Crain did two films in Italy: Nefertiti, regina del Nilo (Nefetiti, Queen of the Nile - released in Italy in September, 1961), and Ponzio Pilato (Pontius Pilate - released in Italy in February, 1962). Crain guest starred on a few television programs, including Riverboat in 1959, and Burke's Law in 1965. She appeared with Dana Andrews in Hot Rods to Hell (released in January, 1967). Her last film was Skyjacked (released in 1972). Crain and husband Brinkman had a total of seven children together; their marriage was a bumpy one, with them both living in separate houses in Santa Barbara. They both died within a few months of one another in 2003. Crain was 78. Grauman's Chinese Theatre, Hollywood, California. Jeanne Crain Forecourt ceremony, Monday, October 17, 1949. 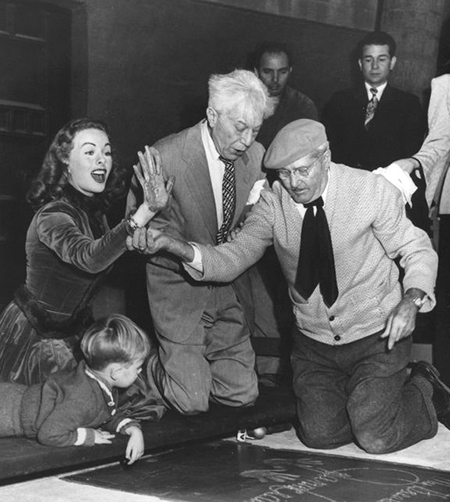 Jeanne Crain and her 2-and-a-half-year-old son Paul Brinkman, Jr., observe Sid Grauman and cement artist Jean Klossner.